If you have never gone on hikes and trekking, this route is the best for your start - not complicated, but incredibly beautiful! After it, it's just impossible not to get sick with mountains! If you have not been to the Himalayas, you need to start acquaintance with them from this route! If you have seen a lot in this life, this route will expand your horizons and certainly will not disappoint! 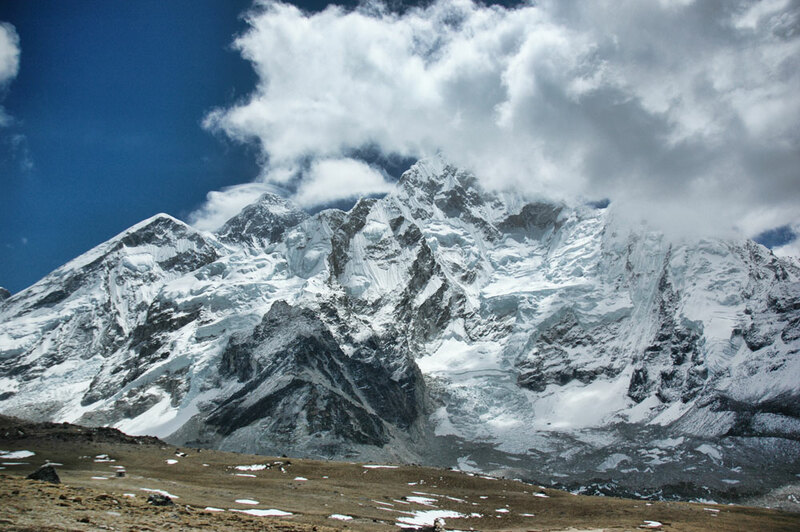 Without a doubt, Sagarmatha National Park is the area of our tracking & ndash; one of the most beautiful places in the world! Mountain-giants, among which the highest mountains of the world, surround our way from all sides. This stern, majestic terrain can not be forgotten until the end of life! At the same time, tracking is not considered heavy and is accessible to people with average physical training, that is practically all. 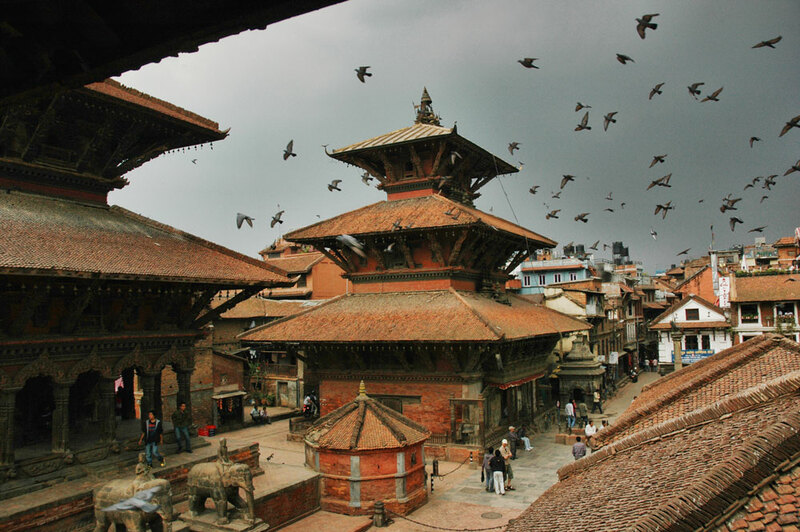 We will see the tremendous consciousness of the Himalayas, various panoramas, replacing each other every day; rise to a height of 5550 meters, walk along the boiling life of Kathmandu, visit the ancient temples, see the original villages and much, much, much more. And all this for a price comparable to with beach rest very average quality! Arrival to the capital of Nepal, Kathmandu, accommodation at the hotel. If there is time left - walks around the city . Excursion program. Visit to the temple of Kasthamandal. 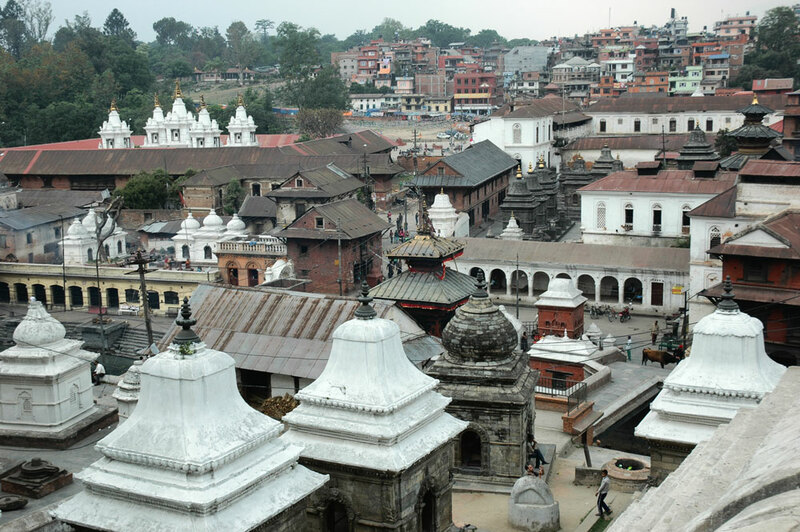 It is located in the historic Maru district, in the center of Kathmandu. 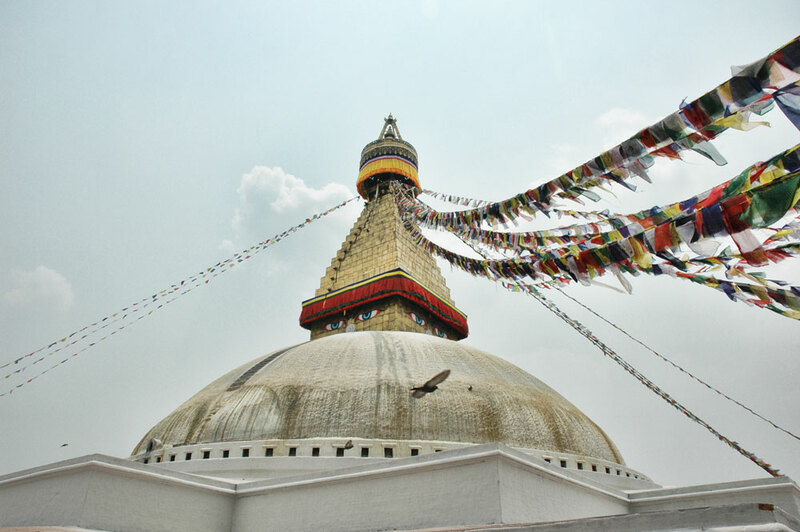 This is one of the largest and most famous pagodas in Nepal. After lunch: Buddhist temple center Bodnath, considered the main center of Tibetan Buddhism in Nepal. Overnight at the hotel. Early in the morning departure by airplane of local aviation in the village. Lukla in the Himalayas, where our tracking begins. The airport in Lukla is a tourist attraction. Its runway is not straight, as in all airports, and inclined and landing-take-off is a real attraction, from which breathtaking and jumping adrenaline in the blood. After receiving the items immediately go to the route. We go about 4 hours along the picturesque canyon, pendant bridges, through picturesque local villages and stop for the night in one of the so-called londzhy - guest house with a minimum of amenities - a typical home for tourists on this route. Lunch in the lodge and set off on a journey. On this day we have not much to go through, but the path is rather complicated due to a prolonged ascent before our next stop - the Namche Bazar settlement. 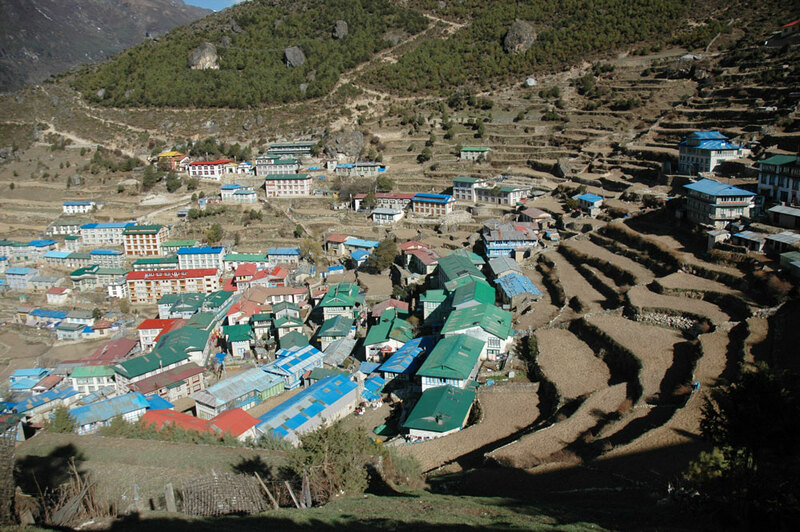 This is a fairly large village with a market, cafes and a lot of souvenir shops - the last stronghold of civilization on the way to Everest. At night we are accommodated in a cozy guest house. Since the altitude in this area is already quite decent - 3440 meters, for normal well-being, acclimatization is required. Therefore, on this day, we will not continue to tear up, but make several leisurely walks in the neighborhoods of light, in particular, we will visit the village of Khumyung. There is a monastery of the same name, and in the rocks above it there is a cave in which, according to the legend, Guru Rinpoche stayed for a few days, but the climb there is rather complicated. Now - forward. A small transition (4-5 hours), during which we will pass Everest View - the point from which the top of the highest mountain of the world - Everest, to the village of Tengboche is very clearly visible. Here we will stay for the night, and in the afternoon we will visit the eponymous Buddhist monastery, which is quite large and significant for the inhabitants of the region. 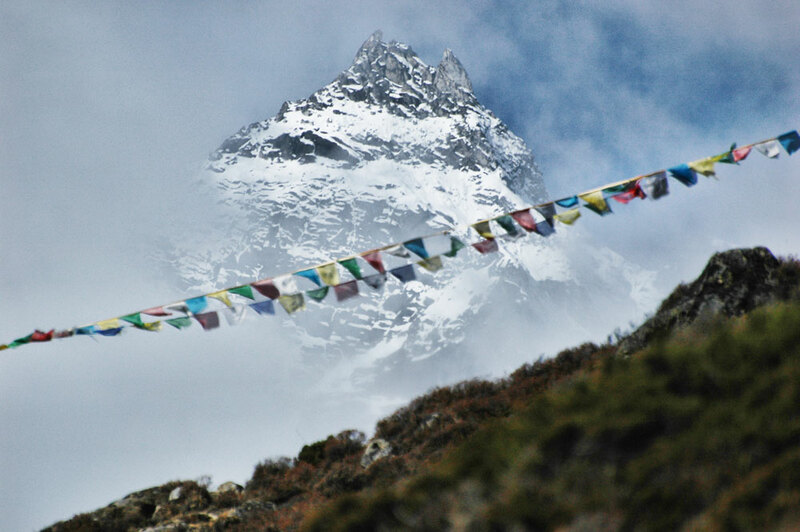 Again a small transition to Pangboche. This is a nice village with a monastery, slopes covered with fragrant junipers, icy burning water in streams and a delicious dinner in the lounge of our cozy house guesthouse for the leisurely conversation of the band members and other guests of this already rather harsh terrain. A small and uncomplicated crossing over the village of Dingboche. The altitude is already 4350 meters - someone can be dizzy, everyone has shortness of breath when walking. But we will go slowly, leisurely, getting maximum pleasure from the fantastic mountains around us and at the same time minimizing due to good acclimatization, the negative consequences of the first signs of mountain sickness. 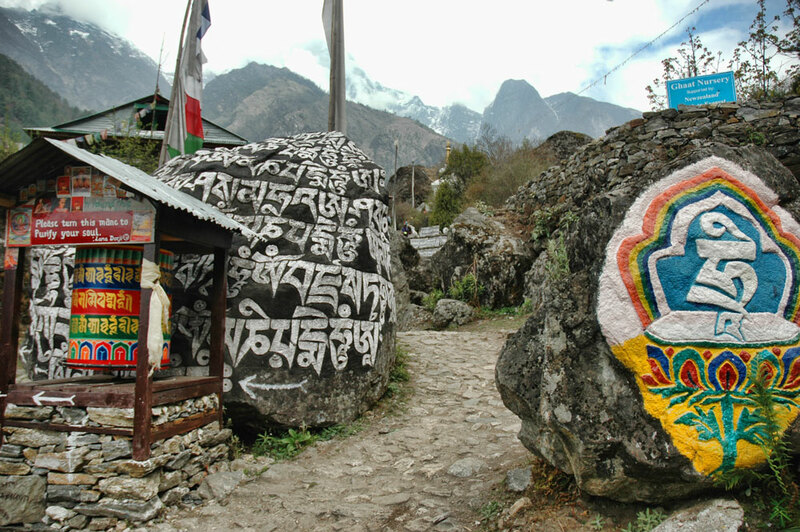 Go to the village of Lobuche. Like all our transitions, this one will not be long and not heavy, but the height is felt all the more. However, the views opening directly from the small windows of our house guest will impress your imagination and will make it easy to forget about the hardships of the hiking life - guaranteed! The most important and most difficult day! We get up early - at 5-6 in the morning and lightly advance to the village of Gorak Shep. From it goes a hollow path to the mountain of Kala Patar - about 500 meters in total, but we will go for 2-3 hours, as the height of the mountain is 5550 meters (only 100 meters below the highest point of Europe - Elbrus! 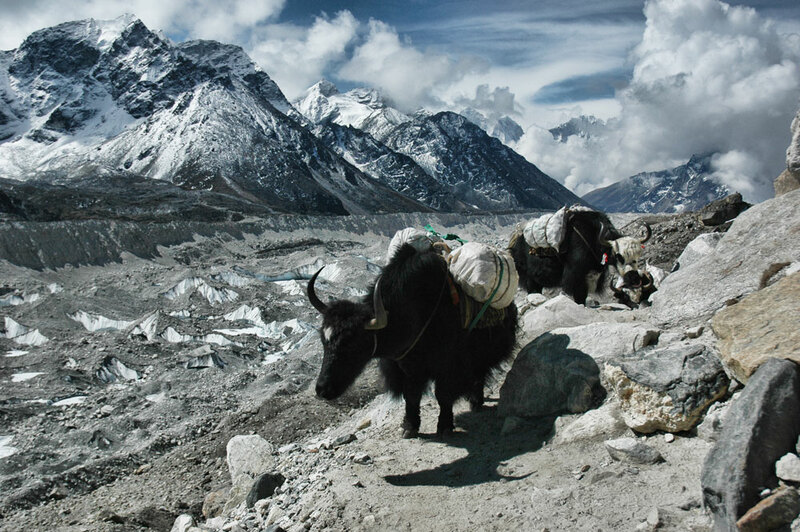 ), But with it offers the most stunning views of Mount Everest. From here to the summit of Everest only 3000 meters - it seems that even a little bit and you can be on the highest point of the world! But this is not true - these 3000 meters are the most difficult in the world. 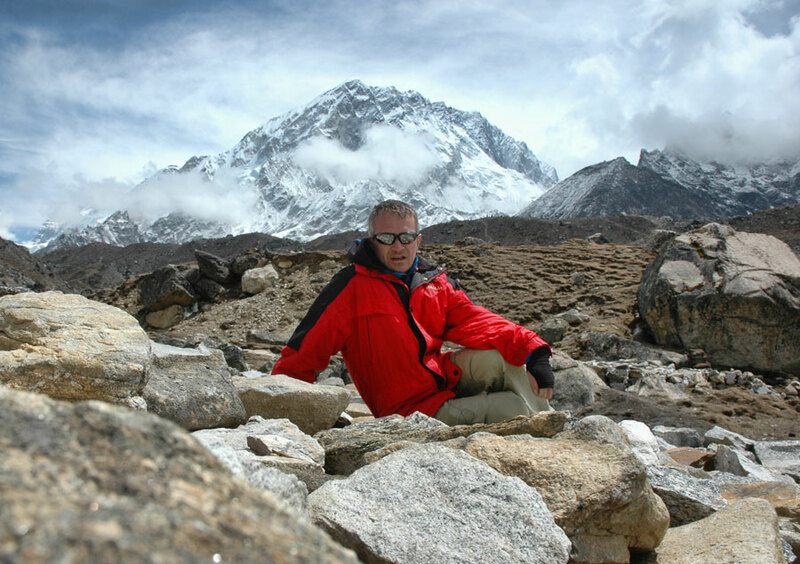 What can we be sure of, going on the way back from the mountain to the base camp of Everest (height of 5300 meters) and talking to real climbers on Mount Everest. These are people with blackened faces, hard-hued at this height of ultraviolet, bearded, but, as a rule, cheerful and cheerful - of different nationalities. They live in the base camp for two or three months and are therefore willing to make contact with tourists coming into the camp. We have breakfast and go on the way back. As we go down, for a day we make a double norm - let's pass the place of our previous overnight stay in Dingboche village and reach the village immediately. Pangboche. Again, the double marital norm - for 8-10 hours we reach the village of Lukla, we rest, we enjoy "civilization" - a cafe, the Internet, souvenirs. At the same time, the real life of local residents is boiling around - not for showing the life of local residents - porters carry huge bales, mules and yaks carry climbing rods to Everest and life support facilities of the area, girls wash clothes right under your feet, and some where the streets are festively dressed columns of Buddhists , noting their religious holidays. Departure from Lukla to Kathmandu. Free time in Kathmandu. Overnight at the hotel. Departure from Kathmandu to home. group and individual photos of each participant made during the whole trip to professional photographic equipment and provided electronically. All expenses not indicated in the program, personal expenses, force majeure, insurance. What is the difficulty of the trip? Will I be able to withstand these loads? This route is not difficult. In a day we will pass no more than 10 - 15 km., Which is quite possible even for unprepared people. 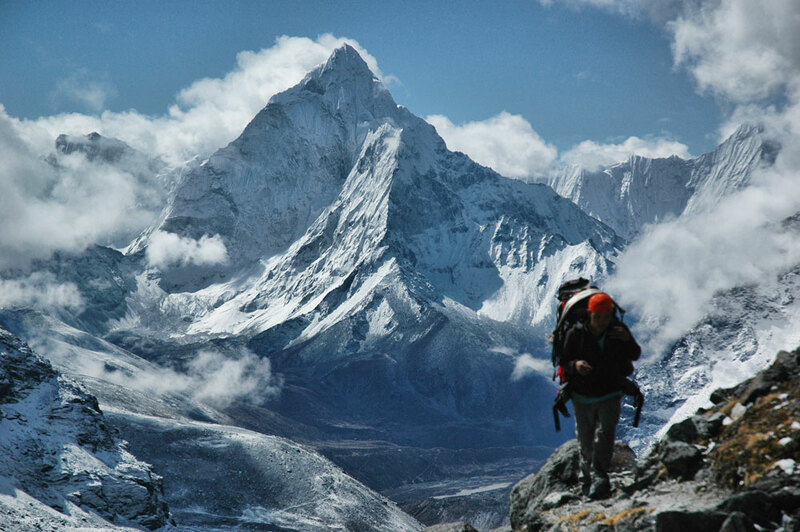 Height (pretty decent - up to 5550 meters), we will recruit slowly, without fanaticism, with good acclimatization, so here too, problems should arise. All this applies, naturally, to healthy people. If you have any chronic diseases, be sure to consult with the instructor about the possibility of your participation. Weight of a backpack in this hike: for men - 12 - 15 kg., For women 10 - 12 kg. In order not to be overweight, consult an instructor beforehand and he will gladly tell you what to take with you on a hike, and from what you can easily refuse. The weather in the mountains is changeable, so you should be ready for both 30-degree heat, and to rain, and to a sharp cold wind. It is recommended to have a waterproof and inflatable membrane jacket, good tracking boots, a raincoat for you and a waterproof cover for a backpack, as well as warm clothes in case of a drop in temperature. Sleeping bag should be no higher than +5 degrees comfort. It is also necessary to have: a rug, a warm hat, gloves, thermal underwear. To walk on stones that after the rain can be slippery, trekking sticks are recommended. 1. If you are interested in this campaign, leave a request through the form below or call the indicated phones, I, Evgeni Androsov or my assistants will tell you in detail about the route and answer all your questions. To book a seat on this tour, a prepayment of 30% of the cost of the hike / tour should be made if before it starts more than 45 days and 50% of the cost if before the start less than 45 days. The prepayment is refundable for 45 days or more before the start of the trekking tour and unfortunately, less than 45 days before the start of the tour / tour, if the refund is related to your refusal to participate (for any reason). If the hike / tour does not take place due to our fault, due to an unsettled group or due to force majeure circumstances, the prepayment will be guaranteed to be returned in any case and in full. 2. After confirming the formation of the group, tickets are bought. Depending on the season and activity of the participants, this can happen for 3 months or 10 days before the start of the hike / tour. Tickets are bought by the participants themselves, however, it is possible to purchase tickets centrally by the instructor or his assistants, in the case when all participants are unanimous in choosing the flight. At the appointed time in the specified place the group meets and travels to the starting point of the route. The group moves with the speed of the last participant, the participants under the guidance of the instructor are engaged in preparing food and installing tents. 3. The instructor reserves the right to refuse participation to any person if he sees that a person is physically or mentally not ready for a hike. On the route the instructor has the right to interrupt the movement of the group and to stop the trip in case of danger of further advancement, as well as due to the state of health of one or several participants. These circumstances are for force majeure, there is no provision for money for the campaign and other financial compensation. 4. If you change your mind / lost the opportunity to participate in the campaign, please, inform us about this as soon as possible, because transport and products for the whole campaign are purchased, calculated and distributed for each participant of the campaign.